We are growing lots of herbs in our garden. And guess which herb is already spreading? Yes, it is MINT. Mint really grows like weed but I don’t mind them cuz I love the smell of mint in our garden. Also Mint gives so much flavor to dressing, marinate, drinks, and dessert! When I was looking at our weedy mints this morning, I wanted to use them to bake a cake today. 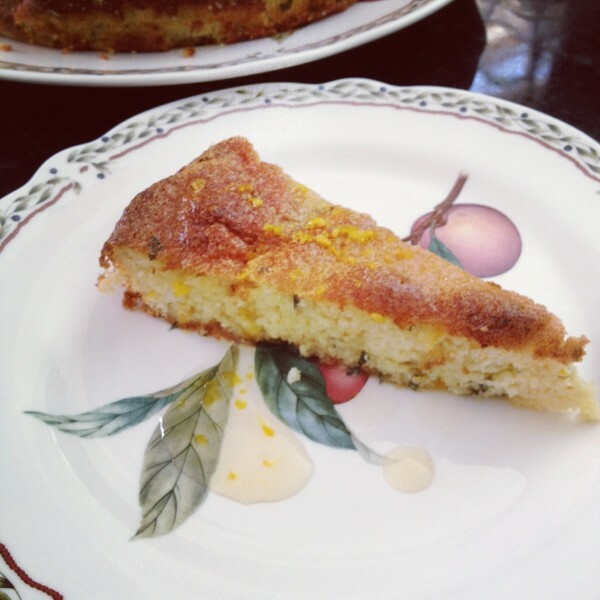 I surfed through the recipe sites and landed to Giada de Laurentiis Lemon Mint Cake! It had great rating and looked pretty easy. But of course, I have to modify the recipe cuz I am working really hard to cut Wheat based flour as much as possible. Also we are trying to cut sugar in our diet. Instead, we use more honey and agave nectar and we love it. So, I read through the recipe and reviews (Reviews often give me good ideas of ingredients substitution), and modified the recipe to fit our diet! Here is my version of Lemon Mint Cake GF/DF/SF! Preheat oven to 350 F. Oil and Almond flour 9-inch round cake pan. I recommend putting the parchment paper on the bottom & side of round cake pan. 1. In a medium size bowl, with an electric mixer, beat the Egg Whites till stiff peaks. 2. In a separate large bowl, beat the Vegetable oil, Agave nectar and Egg Yolks. Add the chopped Mint, Lemon juice and Lemon zest. Add the Almond flour and mix until combined. 3. Slowly add 1/3 of the Egg White mixture into #2 mixture. With a rubber spatula, fold in another 1/3 of the Egg White mixture and repeat one more time. 4. Pour #3 mixture into the prepared cake pan and bake for 35 minutes until a toothpick inserted into the middle of the cake comes out clean. Let the cake cool at least 10 minutes before moving to the platter. 1. In a small saucepan, combine Agave nectar, Water, Lemon juice, and Lemon zest over medium heat about 5 minutes. 2. Remove the pan from the heat and add Orange Liquor. Let the syrup to cool, about 20 minutes. This is light, fresh, and perfect Summer cake!